Animation from external sources is imported into Unity in the same way as regular 3D files. These files, whether they’re generic FBX files or native formats from 3D software such as Autodesk® Maya®, Cinema 4D, Autodesk® 3ds Max®, can contain animation data in the form of a linear recording of the movements of objects within the file. When importing multiple animations, the animations can each exist as separate files within your project folder, or you can extract multiple animation clips from a single FBX file if exported as takes from Motion builder or with a plugin / script for Autodesk® Maya®, Autodesk® 3ds Max® or other 3D packages. You might want to do this if your file contains multiple separate animations arranged on a single timeline. For example, a long motion captured timeline might contain the animation for a few different jump motions, and you may want to cut out certain sections of this to use as individual clips and discard the rest. Unity provides animation cutting tools to achieve this when you import all animations in one timeline by allowing you to select the frame range for each clip. 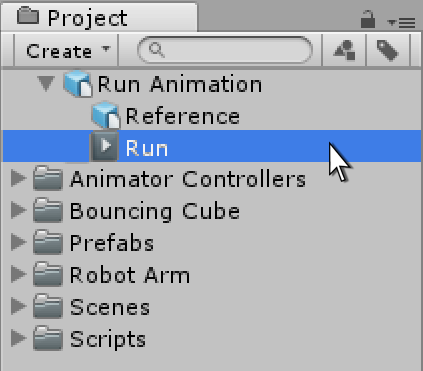 Before any animation can be used in Unity, it must first be imported into your project. Unity can import native Autodesk® Maya® (.mb or .ma), Autodesk® 3ds Max® (.max) and Cinema 4D (.c4d) files, and also generic FBX files which can be exported from most animation packages. For more information, see Importing.